We are a licensed guest house, situated within two minutes of the centre of Grantown-on-Spey. 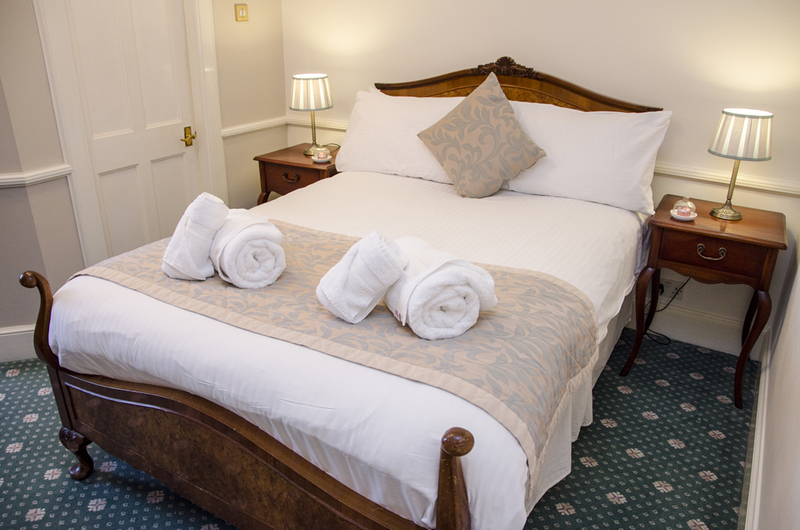 We have eight spacious and comfortable guest rooms, seven with ensuite showers and one with a private bathroom. 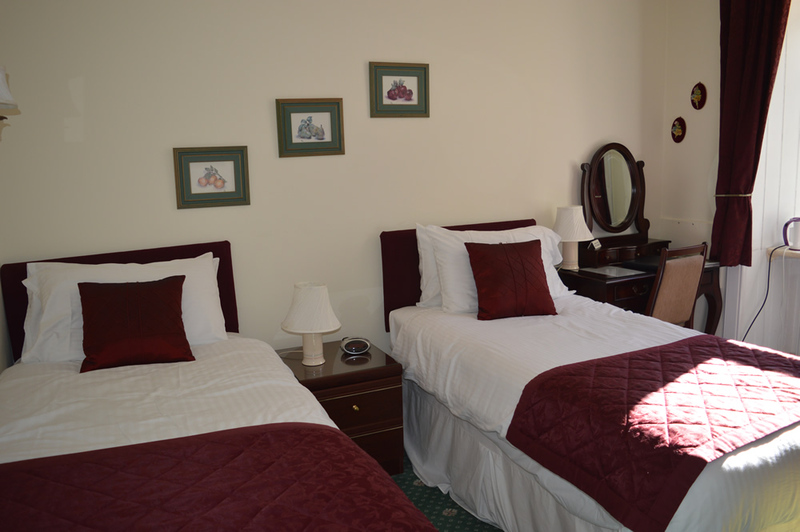 Many of our rooms have superking-sized beds and can also be set up as twins. 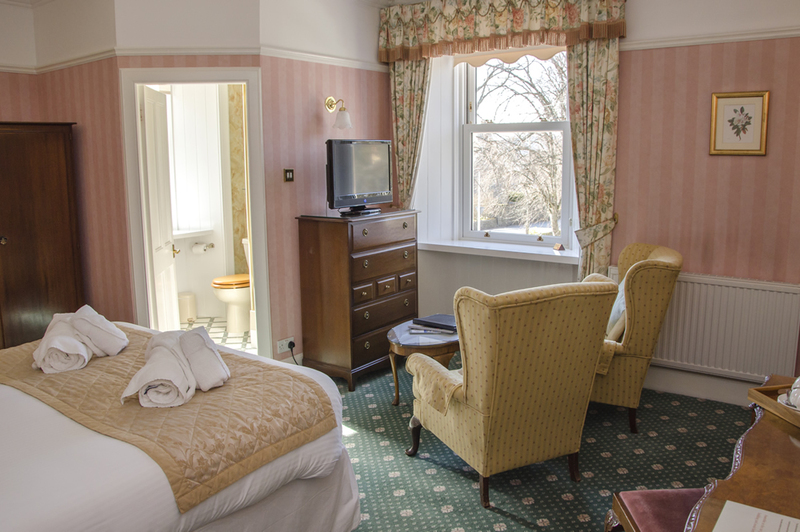 We have two triple rooms and one family suite, with two adjoining rooms. Our showers use a pumped system, giving plentiful hot water immediately. We pride ourself on our excellent breakfasts, which use produce from local suppliers and are served freshly cooked with a buffet of fresh fruits, yoghurt, cereals and more. 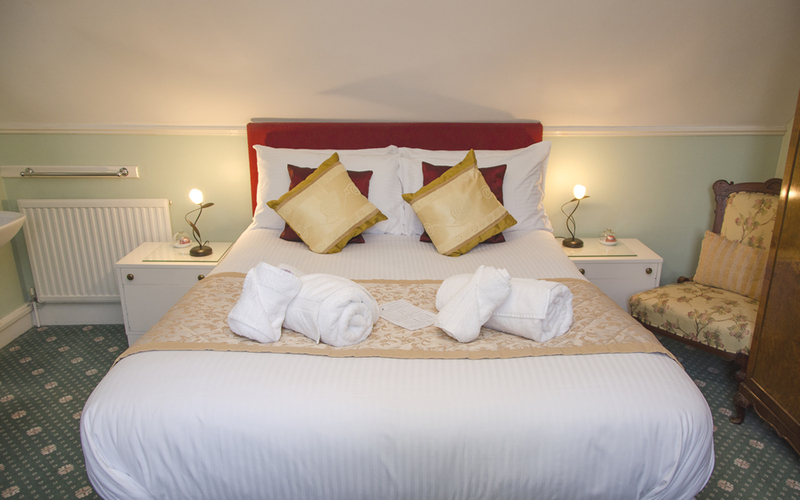 We are very proud of Ravenscourt House and hope you enjoy our guest house and our bed and breakfast offering. 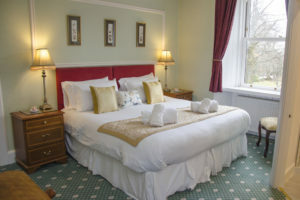 A spacious bright room with a king-sized bed and sitting area, ensuite shower room with pumped shower system, radio alarm, hairdryer, flat-screen television and tea and coffee making facilities. 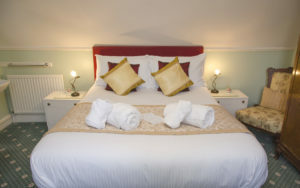 Twin room with private bathroom, with bath and shower with pumped shower system, radio alarm, hairdryer, flat-screen television and tea and coffee making facilities. Superior Double/Twin bright, airy spacious room, which can be set up as a double or twin. Super King sized bed when set up as a double. Ensuite shower room, pumped shower system, radio alarm, hairdryer, flat-screen television and tea and coffee making facilities. 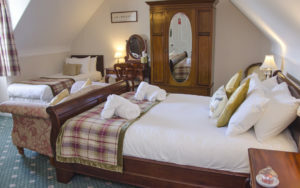 Full internet connection and a very comfortable room, as with all the guest house rooms, a stay in room 3 includes a full cooked Scottish breakfast, using high quality local produce. Standard double room with ensuite shower, pumped shower system, radio alarm, hairdryer, flat-screen television and tea and coffee making facilities. 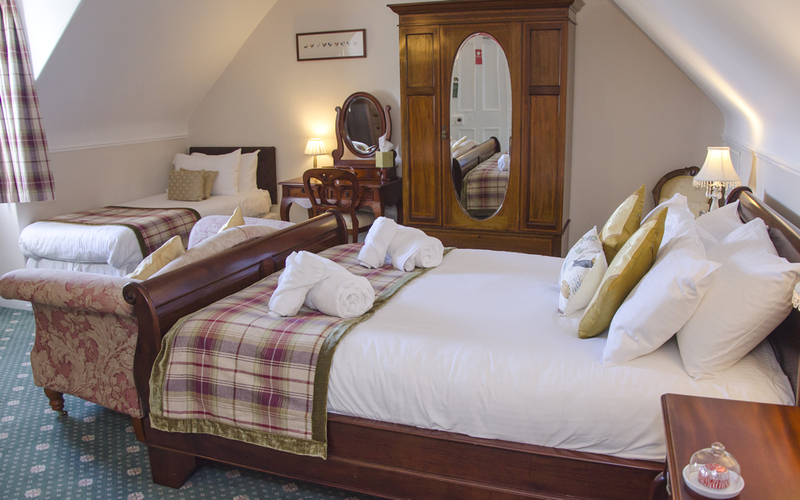 Room 5 consists of 2 adjoining rooms, which share an ensuite shower. One room has a King sized bed and the other room has two single beds. Pumped shower system, radio alarm, hairdryer, flat-screen television and tea and coffee making facilities. This guest house room is ideal for a family group or a party of three or four adults. 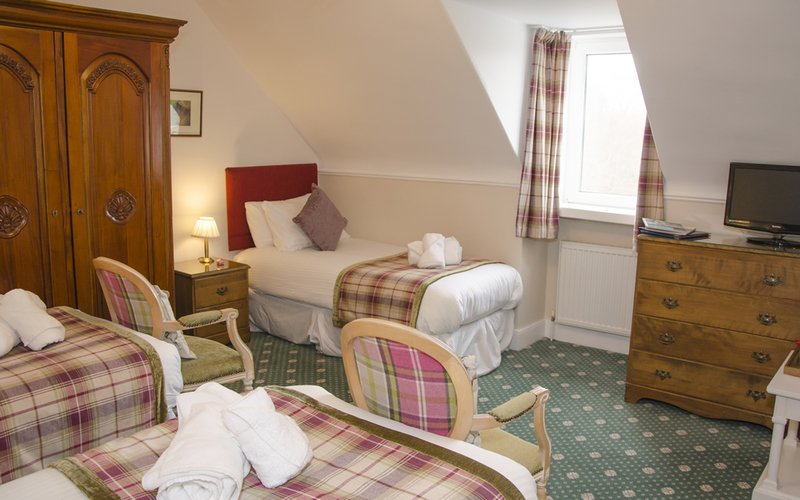 Room 6 is a ground floor room with disabled access and wet room. It can be set up as a twin or a superking. Pumped shower system, radio alarm, hairdryer, flat-screen television and tea and coffee making facilities. 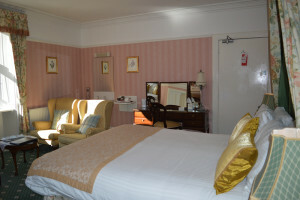 Room 6 does not have a view and adjoins the conservatory, hence is a standard rather than superior room and good value for those wanting a ground floor room. 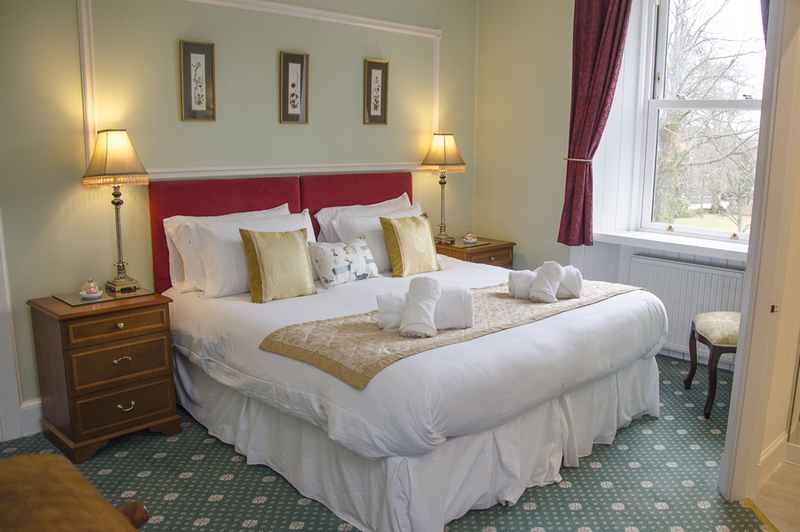 Room 7 is a lovely, spacious room with a king size bed and a single. It has an ensuite shower room, pumped shower system, sitting area, flat screen tv, radio alarm and tea and coffee making facilities. 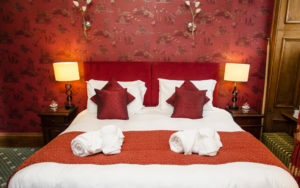 Room 8 can be configured in two ways, with a superking bed and a single, or with three singles. It is a warm and welcoming room. It has an ensuite shower room, flat screen tv, radio alarm, tea and coffee making facilities and a pumped shower system, giving a good, abundant shower. We welcome guests at Ravenscourt Guest House and hope you enjoy our lovely guest rooms in Grantown-on-Spey. We are very near the centre of town, yet quiet and peaceful too. We have ample parking and a good internet connection and powerful showers. Check-out by 10.30am, if you need to check out at a later time, please ask and if possible we will accommodate you.